The Hampshire Superfast Broadband Project is aiming to extend the availability of Superfast Broadband across Hampshire. Hampshire County Council conducted its most recent public consultation between 9th May and 10th July 2014 as a precursor to the selection of British Telecommunications (BT) on 21st November 2014 for its Phase 2 project under the Broadband Delivery UK (BDUK) programme to deliver Superfast Broadband to the defined intervention area with State aid approved public funding of £18.4million. This followed the award of the Phase 1 project to BT on 31 January 2013 with State aid approved public funding of £11,062,307. In August 2015, BT announced that take-up across the UK was likely to exceed the forecast level of 20%. To date, BT has made available up to £129m across the UK to meet the contractual obligations outlined above. Hampshire County Council has received an initial allocation of £1,772,000 and intends to reinvest this in further coverage as part of the current contracts. The purpose of this public consultation is to confirm the areas which do not have Next Generation Access (NGA) broadband infrastructure delivering at least 30Mbps, or where there are no plans to provide such infrastructure over the next three years. These are described as “white NGA areas”. This is to enable all interested stakeholders - the public, businesses and telecommunications providers - to comment on the proposed white NGA areas before further coverage is committed. This State Aid public consultation will be open and run for one calendar month from 29 April 2016 until 29 May 2016 . Once the State aid public consultation is complete and the white NGA areas have been finalised by Hampshire County Council a change will be agreed by the local body and BT to deliver the extended Superfast Broadband coverage. The European Union State Aid rules are designed to ensure that any use of public funding (‘State Aid’) is targeted at areas of market failure and produces positive market outcomes while minimising any distortion to competition. The State Aid rules require public interventions to be targeted so as to limit the risk of crowding-out or disincentivising existing and/or concrete planned private sector investments that would otherwise meet the desired policy objectives. In the context of broadband, the 2012 State Aid Decision permits the use of public funding only to extend broadband coverage in geographic areas where there is no provision of Superfast Broadband and it is unlikely to be developed in the near future (within the next three years). The ‘EU Guidelines for the application of State aid rules in relation to the rapid deployment of broadband networks’ (2013/C 25/01) can be found at: http://eur- lex.europa.eu/LexUriServ/LexUriServ.do?uri=OJ:C:2013:025:0001:0026:EN:PDF. The objective of the further investment is to provide access to NGA infrastructure which is capable of delivering access line speeds of at least 30Mbps. The objective of this intervention is to target the reinvestment funding at areas that were designated as white NGA areas through the previous public consultation (carried out by Hampshire County Council 10th July 2014 and where there have subsequently been no plans to deploy as part of the existing contract between Hampshire County Council and BT. These areas are identified as [white] on the map at Annex [A] to this document. Hampshire County Council has changed its definition of NGA white areas from that used in its previous consultation of 10th July 2014. In Annex [A], areas with speeds below 30Mbps are identified as “NGA white areas”, whereas they had previously only been identified as NGA white areas where they had speeds below 15 Mbps. Nevertheless, the area that is the target of this intervention is identified as NGA white under both approaches . We also request confirmation from an authorised signatory that the information provided is suitably accurate and up-to-date. Please note that any information you provide in your response will be treated as commercially confidential to your organisation. However, it may be necessary to share some or all of your response with our professional advisors and/or DCMS/BDUK, Ofcom, the National Competence Centre, and the European Commission, in the course of seeking State Aid approval. Hampshire County Council is also subject to certain legal obligations to disclose information in certain other limited circumstances. It should also be noted that it is a State Aid requirement to utilise the information provided in response to this consultation to refine our State Aid maps to define White/Grey/Black areas for NGA and Basic Broadband. However, the published maps will show the aggregated White/Grey/Black NGA and Basic Broadband areas, not the data provided on a per-operator basis. If you are a telecommunications provider, this section specifies the information you are requested to provide in response to this State Aid public consultation. 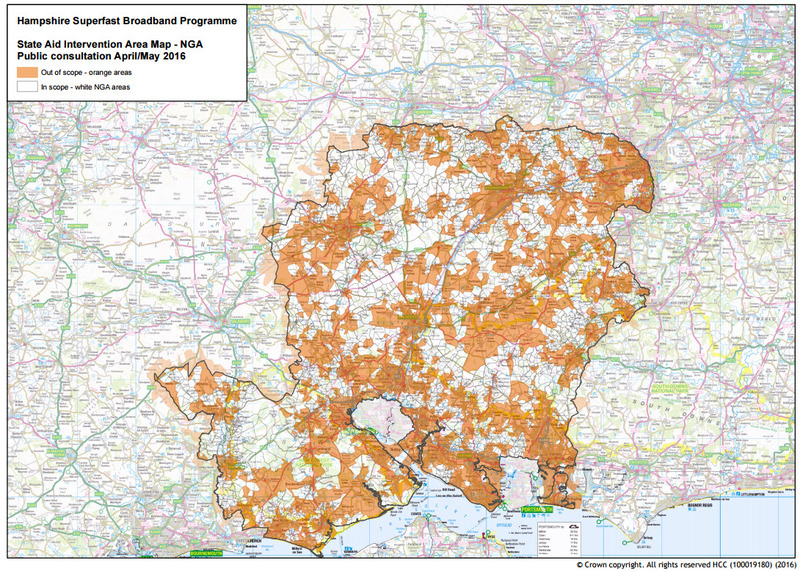 Hampshire County Council is requesting information on, and supporting evidence for, any current broadband infrastructure or planned investment (within the next 3 years) in broadband infrastructure in the county of Hampshire where these may not already be included within the proposed NGA and Basic Broadband Intervention Area maps attached. For any current or planned coverage not included within the proposed State Aid Intervention Areas shown on the attached maps, Hampshire County Council is requesting information on the premises covered (or planned to be covered) by your broadband infrastructure investment. Hampshire County Council is asking for information on coverage of Basic Broadband and NGA Broadband coverage separately (to enable us to map the Basic Broadband and NGA White/Grey/Black maps required for State Aid purposes). By ‘covered’ (or ‘passed’) Hampshire County Council means that fixed network infrastructure is or will be available to the premises, potentially subject to a final drop connection, or that the premises are able to receive a suitable quality radio signal over the air interface (in the case of wireless or satellite coverage), potentially subject to the installation of a suitable antenna. Where an operator is responding with current or planned coverage for NGA, it must respond to confirm those premises that it is able to provide a broadband service with an access line speed (or equivalent) of at least 30Mbps. Detailed maps for NGA and Basic Broadband showing the existing coverage, and separately maps detailing the planned investment in NGA and Basic Broadband for at least the next 3 years. Details of the actual premises covered or passed (within postcodes (at 7-digit postcode level), and confirmation that fixed network infrastructure is available to the premises, potentially subject to a final drop connection, or that the premises are able to receive a suitable quality radio signal over the air interface (in the case of wireless or satellite coverage), potentially subject to the installation of a suitable antenna. Please supplement the required information above with any supporting evidence as you consider appropriate (e.g. links to public websites, etc). A map showing 'White Areas' in Hampshire that are being considered for further investment is shown below and can be downloaded as a PDF. A supporting list of postcodes can also be downloaded as an excel spreadsheet.